Glyphs can tell you a lot, but myths, elements, planets and those pesky pictographs can tell you even more (as long as you stay on the lookout for symbolism and congruency). So I’m going to make sense of some Greek figures of myth, while concurrently examining the qualities of Libra’s constellation and ruling planet, in hopes of shining a brighter light on the sign’s close association with scales, balance, and equality. 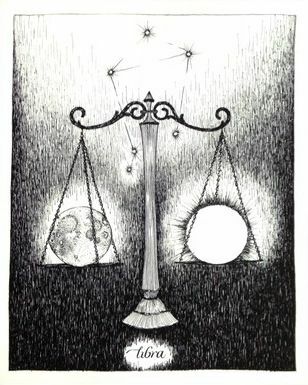 It is Libra’s tie to the civil realms that reveals more about the air sign. While there are a great deal of tales about the sign’s ruling roman goddess and her Greek colleague, they don’t quite match the qualities of the Libran character. The more appropriate representatives are the Greek god of light, Apollo, and the 9 Greek Muses… Apollo ruled, among many things, music, medicine, prophecy, reason, truths, and other occupations and principles that are intended to bring a sense of light and order to an otherwise darkly disordered world. Being the patron god of poetry and music, Apollo was also in command of the 9 Muses [inspirational deities of cultural humanities]… Many a Libran feels called to serve the public in ways dictated by the 9 Muses. So drama, dance, therapy, music, and science are subjects in which they are immensely talented and naturally drawn to. Libras find their identities when in a dual-partnered relationship. This is the underlying message hidden in the glyph. Libra’s glyph begins like Gemini’s, with two parallel lines. The top line is arched, representing the expansion of individuality that can only result once Libra has met its match. Partnerships help Libras come into their own, prompting them to grow into a more outspoken, exacting, and emotionally democratic individuals, while still being part of a pairing. Do the Libran glyphs make more or less sense? It’s difficult to slenderize the entiriety of Libra’s myth and glyph, but I tried to give the most important bullet points here, taken from my 20 page ebook – Libra: the Equanimity. Camille Liptak is Cosmic Cannibal.